The Rock-Ola Harley Davidson Bubbler CD Jukebox Is Legendary. 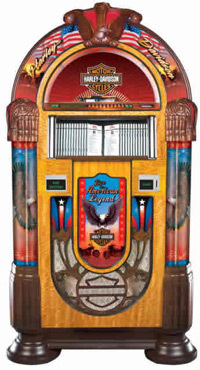 The American Legend Jukebox licensed by the Harley Davidson Company is popular world wide. The American Eagle sets the theme for this iconic nostalgic jukebox featuring illuminated custom screened glass panels, arch lighting and pilasters. Intricate, expertly finished woodwork and molded accents at shoulder and crown distinguish the Harley Davidson from the rest of the pack.